A few days before Hurricane Irma was set to make landfall in Florida (and in the city I call home, St. Petersburg), I got a text from my landlord. The gist of that text? 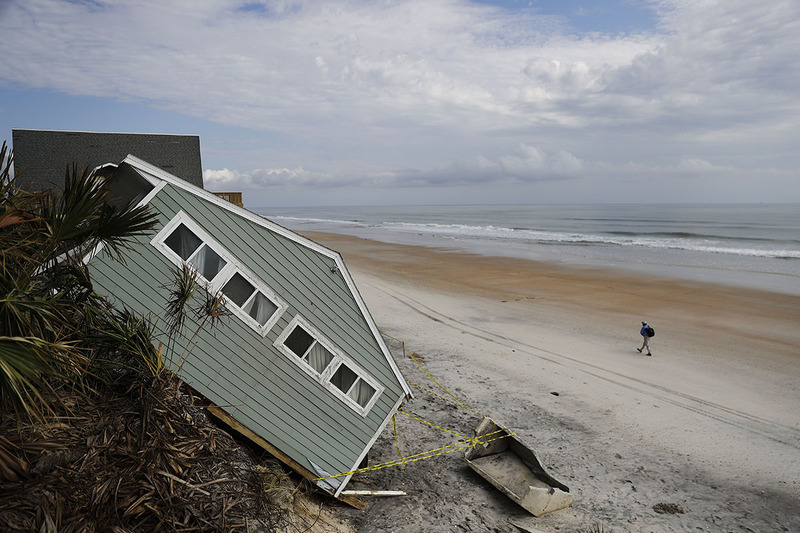 Get out, and do it now: that house is old and, even with the right precautions and hurricane preparedness measures, may not be standing when this thing is through. I packed my bags and drove the two hours inland to my parents’ house to wait out the storm. While I was thankful that I had somewhere safer to be (not everyone does! ), I couldn’t help but think about my little home and worry about whether or not I’d have to find somewhere new to live or if I would have to deal with weeks (or even months) of repairs. Irma ended up downgrading from the projected Category 4 to a gentle(r) Category 1 by the time it struck the city I’ve grown to love. While many people in my area were (and, as of Friday, still are) without power, the worst of the damage seemed to pass us by. But not everyone has been so lucky. Many Florida and Texas residents have been left with lasting damage to their rented properties and homes due to hurricanes Irma and Harvey. Now, as the traffic lightens, the gas is resupplied, the power is restored and the flooding recedes, people are being cleared to return to scope out what remains of the places they call home. In some cases, it’s not much. As people return to their damaged and even unlivable homes, a lot of renters are wondering exactly how responsible they are for these structures. Houston Mayor Sylvester Turner recently urged landlords to be lenient and renters to be reasonable. He was also quick to warn landlords who might try to unfairly terminate leases or continue collecting rent while repairs go unaddressed. “We will not tolerate anyone in the city being victimized,” he said. Often, in disasters such as these, renters and landlords end up in a sort of catch-22. Landlords need renters to continue paying rent so that they have more immediately available funds to fix the damage while they wait for the insurance payout. However, many renters believe they shouldn’t have to pay rent at all while their home is damaged or unlivable. Without funds there are no fixes, but without fixes there should be no funds — so the cycle goes. Fort Bend County Justice of the Peace Joel Cloudser stressed the importance of “not withholding rent” and giving your landlord the opportunity to fix any fixable problems. If your rental unit is uninhabitable and unfixable, then, he says, you’ll be allowed to terminate your lease, collect a prorated share of the rent and move out. If you are able to stay, you may also be able to reduce your rent in proportion to the damage to your unit. This renter’s rights Q&A with an expert has helpful information that may aid you in understanding your rights. Hurricane Prep: Whose Job Is It Anyway? Another dilemma I — and many people — ran into during the week leading up to Irma’s arrival: who’s responsible for boarding up the rental unit? In some cases, a landlord may take charge and show up at your home to board windows, stack sandbags and secure the property. In other cases, they may expect you to take care of the pre-hurricane prep. In the days leading up to Hurricane Matthew in 2016, Leslie Powell, the executive director of Legal Services of North Florida, who specializes in housing law and disaster response and recovery, told WLRN there’s no real legal obligation for a landlord to help stormproof a property. The landlord may have an obligation to the insurance company to protect the home to a certain degree, she noted, but usually, the effort put in by a landlord ends at protecting their own assets. Before the storm, contact your landlord to ask about preparations. Make a plan, and decide who is in charge of storm-proofing the unit — and to what degree. For future rentals, consider having a “Hurricane Clause” written into your lease that includes information on who will provide materials and labor for hurricane preparations. Additionally, you may want to consider purchasing renter’s insurance. In the event the rental unit is destroyed, the landlord will collect their due from the homeowners insurance policy — but you could be left with nothing. And no matter what you and your landlord decide to do, one of the best ways to protect your own well-being during a hurricane is to make sure you have a complete emergency kit on hand — before the storm shows up and everyone floods the stores. These five strategies will help you build a budget-friendly emergency kit to help keep you and your family comfortable (it’s all relative, folks) for the rest of hurricane season. Grace Schweizer is a junior writer at The Penny Hoarder. She’s a third-generation Floridian and therefore a card-carrying lifetime member of the hurricane club.